Veganism is on the rise in Australia. According to data from Google Trends, Australians are searching for items related to veganism at a rate that is four times what it was just five years ago. 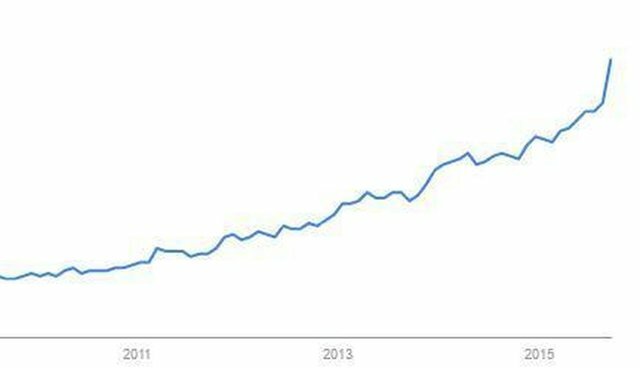 Google Trends data shows how the proportion of all searches including a keyword changes over time, so this indicates a sharp rise in Australia's interest in veganism (rather than simply an increase in overall search volume). "Access to information about the realities of animal agriculture has increased dramatically in recent times. A number of groups have done good work exposing the realities of the life of animals on farms," says Tim Westcott of Queensland, "More vegans has also created a knock-on effect: it's more difficult to ignore the plight of animals when you have friends or family who have gone vegan." The documentary Lucent, released in 2014, is one glimpse into the realities of animal agriculture that has reached many Australians. The documentary shows through hand-held and hidden camera footage the darker side of Australia's industrial pig farming industry that often occurs behind closed doors, showcasing footage from over 50 farms and slaughterhouses across Australia. On a more positive note, many Australians have also become acquainted with the friendly and social faces of farmed animals through the work of Edgar's Mission Farm Sanctuary located in Victoria. The sanctuary's popular videos of pigs running about with their friends and injured lambs being nursed back to health have reached millions. While vegan foods may have been perceived as bland in the past, Australians are quickly realizing this is not the case with restaurants from Sydney's Nourishing Quarter to Smith and Daughters in Melbourne showing that one can be vegan without sacrificing any flavor. Australians are increasingly trying these ideas out at home as well. Popular Google searches include "vegan recipes", "vegan food", and "vegan cake". The increase is not being driven solely by vegans, however. Many Australians who have not cut all animal products out of their diets are still opting for more vegan foods. As one Victoria resident who we interviewed shared, "I want to reduce my contribution to animal cruelty as much as physically and realistically possible." Many individuals also choose to reduce their consumption of animal products for health reasons. "Two whole chicken eggs make up the RDI for cholesterol in the average adult diet. Now imagine that the average adult has scrambled eggs for breakfast, along with bacon or other breakfast meats, and then another meat dish for lunch and/or dinner," says Adriana M. from New South Wales, "This is not uncommon dietary behavior in Australia and this behavior is leading us into a lifetime of bad eating habits and the diseases that are associated with high cholesterol/animal fat diets. These diseases are a drain on people individually and a drain on the tax payers that eventually have to pay for the medical costs associated with such diseases." More than anything though, the Australians we spoke with echoed the idea that being vegan in Australia is now easier than ever before. "As more and more people are making the change, a lot of companies are choosing to produce more vegan products," says Sarah Quirey of Brisbane, "We have so many faux meats, cheeses, milk etc, which is really helpful for people who are coming from a meat-eating background. It really aids those people into transitioning into the lifestyle. Restaurants are also offering more vegan options too; I guess they've been feeling the pressure!" According to Tim Westcott, the quality of vegan alternatives available locally has notably improved. "In most supermarkets, one can find non-dairy milks, Nuttelex (vegan margarine), and meat alternatives. The quality of these alternatives that are available has also noticeably improved in the last five years." The rise in veganism is one that many expect to continue into the future. As Bianca Payne from South Australia shared, "There are becoming more and more options for vegans, which makes it easier for people to be vegan. And as more people become vegan, even more vegan options become available."